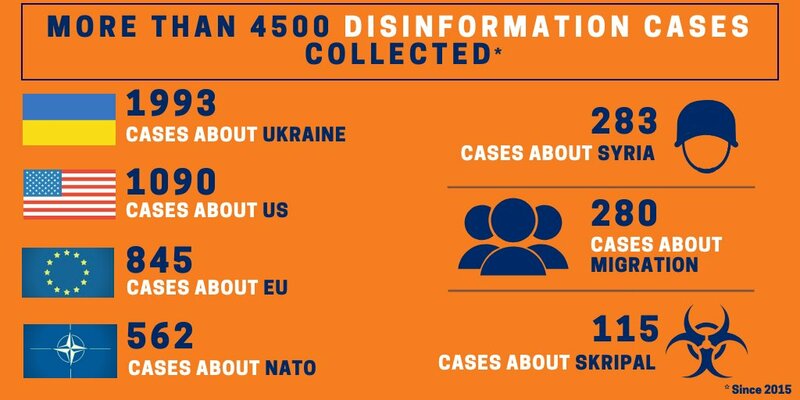 The East StratCom Task Force’s website EU vs Disinfo and the oldest Ukrainian fact-checking initiative StopFake, two of the key European players in tackling Russian propaganda, have recently released their latest estimates of the disinformation cases they debunked. The released data offers a glimpse into the topics of special interest of Russian propaganda and into the key Ukraine-related narratives of disinformation. At publishing time, the online database of EU vs Disinfo contains 4,564 disinformation cases. The agency has been collecting and debunking the fake news and propaganda stories since 2015. Most of the items in the database are disinformation stories spread by Russian news reports and on TV shows. Ukraine has been the key focal point of Russian propaganda. 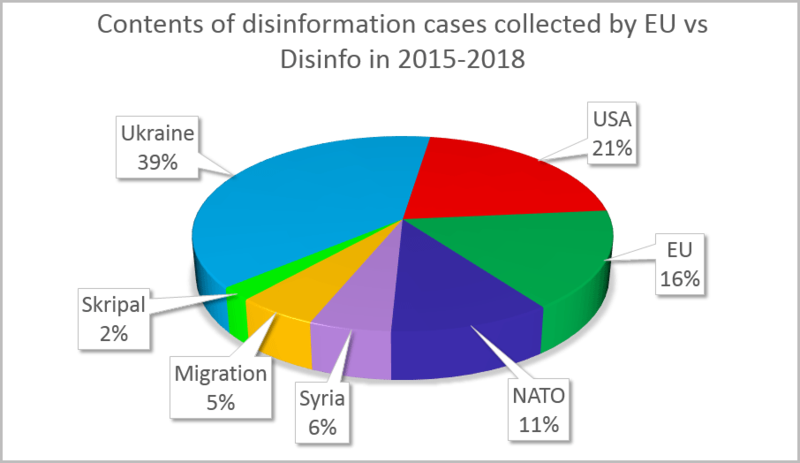 The latest statistics of the disinformation cases registered by the European External Action Service East Stratcom Task Force. The ratio of the narratives most used in Russian disinformation. Note: less popular topics omitted, thus other figures might become slightly bigger on the diagram. While EU vs Disinfo collects all narratives, StopFake focuses on the Ukraine-related ones. Throughout 2014-2017, StopFake debunked 919 disinformation stories and messages, 804 of which were news pieces. The content analysis of StopFake’s debunked stories shows what Ukraine-related narratives dominate the Russian disinformation efforts. StopFake identified 178 media outlets as the sources of fake stories. Russian media were the absolute leaders on the list (85 media outlets out of 178), additionally, 20 more outlets were located in the Russian-run Luhansk and Donetsk “people’s republics,” the news of which are often uncritically spread by the Russian press. 34 outlets from Ukraine and 39 from other countries were the other spreaders of fakes. The external ramifications of the ecosystem include a Russia-affiliated network of media outlets and Russia’s support for alternative media outlets and NGOs in foreign countries. The domestic part includes numerous media organizations of various types, including state-run media, fake media run by the infamous Internet Research Agency a.k.a. the “Troll Factory” (like “Kharkiv News Agency” and Riafan) and so on. According to StopFake, the leader in spreading anti-Ukrainian disinformation is Zvezda, the media holding by Russia’s Defense Ministry. StopFake debunked 79 fake stories spread by Zvezda. The Kremlin-owned website Ukraina.ru (73 stories), part of the Russian state-owned Rossiya Segodnya media group, came in second place. The information agency RIA Novosti from the same Rossiya Segodnya was third, with 62 stories. Among other leaders in spreading anti-Ukrainian disinformation, StopFake also named large TV channels such as Rossiya-24, RT, NTV, Channel 1, another state-controlled news agency TASS, newspapers Komsomolskaya Pravda and Izvestia, and popular online media Lenta.ru and Vzglyad.ru. 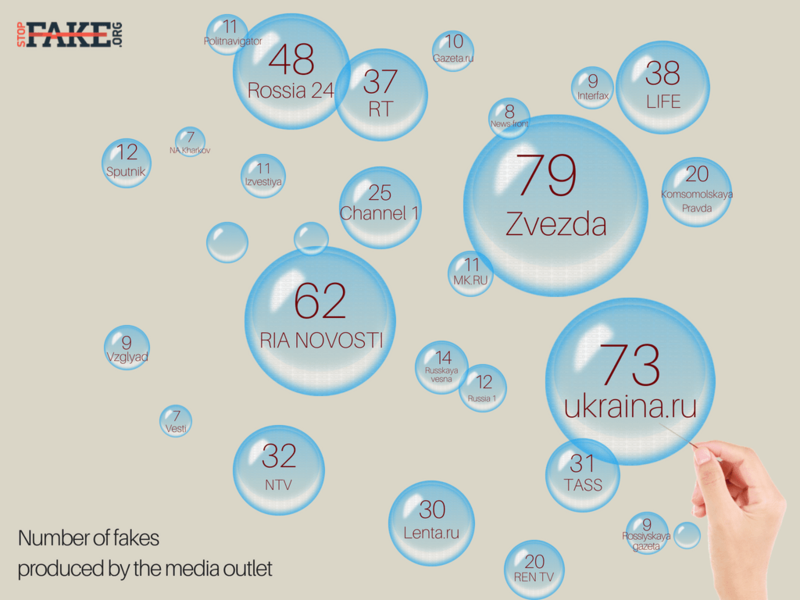 Back in 2016, StopFake co-founder Yevhen Fedchenko identified 18 major Ukraine-related fake narrative topics spread by Russian propaganda by analyzing 500 debunked disinformation items. For post-Maidan Ukraine, Russian propaganda’s most used narratives were the Euromaidan as “coup d’etat” which brought a “Western-backed junta” (mostly “US-backed”) to power, and “fascism” as the main ideology of the post-Maidan government, Fedchenko notes. 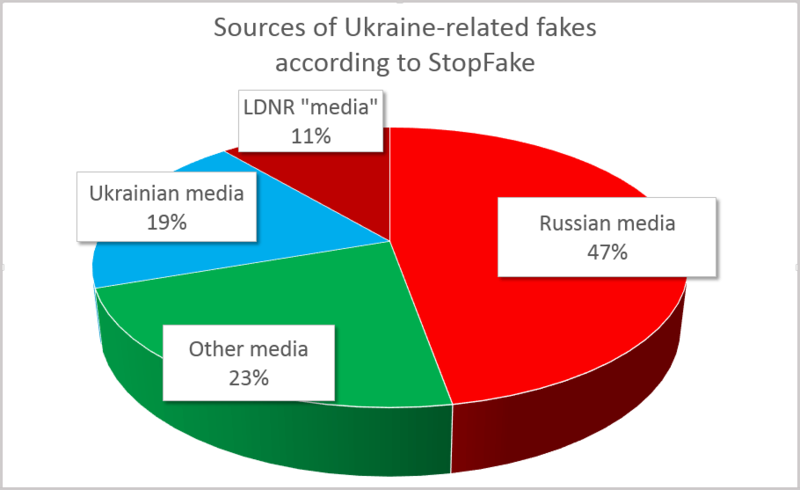 Key Ukraine-related propaganda topics among 919 cases debunked by StopFake. 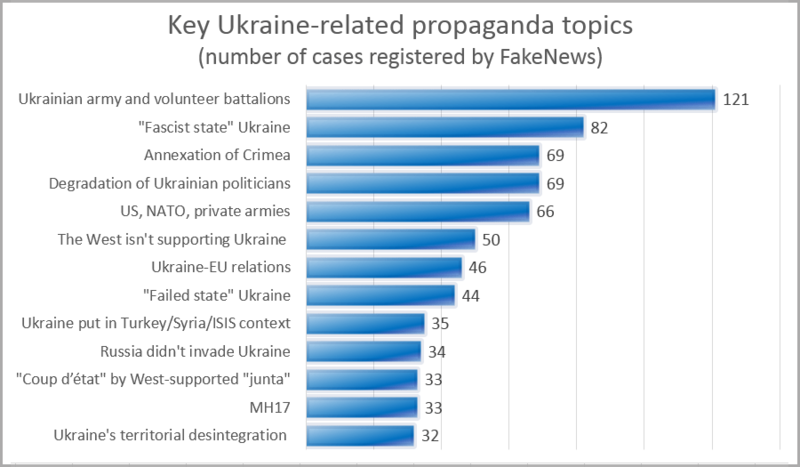 StopFake concludes that the fake news narratives show persistent efforts of Russian propaganda to create the image of Ukraine as a failed state by means of delegitimizing its armed forces, government, and state policies. Meanwhile, Ukrainian society is presented as such where ultraright opinions and groups are becoming more and more influential or even prevailing.